I am of Puerto Rican descent and was born and raised in New York City. You can call me a New Yorican. I grew up in Queens, Jackson Heights. Have you ever been to Puerto Rico? What are some of the most remarkable places in Puerto Rico? There are many beautiful places there. One remarkable place in particular is a surfing town called Rimcon, located on the West Coast. It’s very small and there are no big hotel chains. There are a lot of surfing going on. It’s a very beautiful place. Do you like to surf? No, I’m not very good at it. I have two older sisters and two younger brothers. How did it feel like to grow up as the middle child of the family? It was a lot of work. You get beat up by the older ones, and you have to beat up the little ones, so you’re right smack in the middle. What did you dream of becoming when you were little? Did you ever imagine yourself working at a school? No, but I imagined being a superstar performer on Broadway. Why didn’t you become who you wanted to be? I don’t know. I never really tried to pursue my dream. I guess I just gave up on it after college. I guess I wasn’t pushed in the right direction. I didn’t hang around with people that were in that circle so I wasn’t taught the way of auditioning or the type lifestyle it was around people who were interested in that career. My second thing was music, so I did a lot of music in college, such as teaching music. I play some piano, but I was mostly a vocal musician. I did a lot of singing and taught a lot of singing. What are some of the differences between the experiences that you had in Bryant compared to the experiences that students have here at BSGE? That’s a good question. I went to high school with almost 3,500 kids. Bryant was a very big school. It was very hard for teachers to remember everybody’s name. Teachers taught 200 kids a day. It wasn’t the hands-on approach or the big-brother teaching, what I like to call BSGE, where teachers are really involved with students one on one here, a lot more than in some of the bigger schools where the teachers don’t have enough time to be able to do one-on-one work with a lot of the students. Some of my classes in high school had 35 kids. Our biggest class here I think is about 25. There’s a big difference in the amount of students in the classroom. Obviously, BSGE being smaller school, does not have as much clubs and activities as the bigger schools. But I think we do a pretty good job giving the kids here at BSGE some after-school outlets. Did you consider yourself a good student in high school? Yes, absolutely. I worked hard and was on the Honor Roll for junior and senior year. What were your interests in middle and high school? Well, I was a big performer. I did a lot of stage shows in high school. I did all of the musical theater shows, participated in plays like Hair, and Grease. I did a lot of choral shows, I was part of the chorus. Junior high school was the same. I participated in many performances. You seem to like music a lot. Who’s your favorite band? That’s a tough one. Right now, I really like a band called The Rescues. They are a live band who sing in four-part harmony. So they’re talented musicians, but also talented singers. I don’t know in particular. I like Stevie Wonder and Justin Timberlake. You seem to be participating in many activities in BSGE during after school, such as the Girls’ Softball Team. Can you tell me about it? Well, the Girls’ Softball Team started in 2005, where I started a program called the Girls’ Softball Club here at BSGE. It took off from the girls wanting to just participate and practicing to wanting to compete. 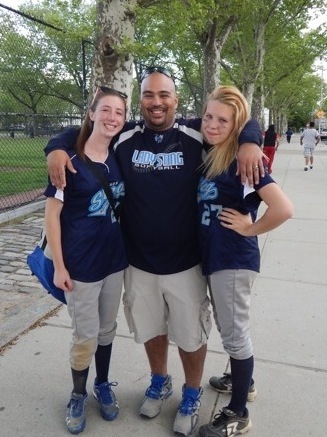 BSGE Softball is actually the first PSAL team that BSGE ever had. I’m proud to say that we started that with the club here at BSGE. Why did you decide to coach the Girls’ Softball Team? I have a history in softball. I played baseball in high school, but I was being taught how to teach softball starting in high school. I was the assistant coach for the head softball coach at Bryant. In college, I assisted with the college team, and from there I found a love for the sport. When did you start working at BSGE? I have been at BSGE since 2003, 6 months into the first school year. BSGE started in September 2002, I joined them in February, 2003. How was the transition like working at BSGE? The transition was coming from a private sector. I was an assistant manager for a pharmacy and I worked at hotel security before I came to BSGE. I was also 23 years old when I started here, so I was very young. How do you like working at this school? I love it. I’ve been here for 12 years. What are your likes and dislikes at BSGE? I wish we had more space for the kids, like auditorium space, gymnasium space, bigger workout rooms for the kids. Spaces for kids to participate in what they like to do. Maybe even a bigger art room. Music room also. Things like that are important outlets for kids. Do you think working at BSGE changed you in any way? Absolutely. Working at BSGE taught me how to handle and deal with children. What are some of the things you do outside of the school? Well, I have two children, so there’s not much time to do anything else. But outside of that I play golf, DJ, and I’m a sports watcher. I heard that you are interested in fantasy sports. Can you tell me something about it? Oh, thank you Mr. Lakhaney, thank you very much. Without winning a championship, I’m the best fantasy sports player in all of BSGE. You can say that there’s not one person in this school who’s better than me at fantasy sports. Fantasy sports consist of a whole bunch of adults putting together fantasy teams based on the sport. So, for example, a bunch of adults put together a football team with the best football players in real life. You get points on how well the actual players do in real life. That’s why it’s called fantasy sports. How does it feel like to always be in second place at fantasy sports? I feel a little like Susan Lucci. He’s dirty, Mr. Lakhaney. It feels very nice to be in second place. Um, Mr. Lakhaney. Yeah, he’s fantastic.